Night falls on Rua Augusta. White tiles -- polished by age beneath the feet of throngs who have walked here -- reflect the yellow street lamps as if we were standing atop the water of a reflecting pool, flowing gently under the arch to the Praça do Comércio and the harbor beyond. We've descended the hill above us, from Castelo de São Jorge and Sé de Lisboa down to this pedestrian avenue animated by the energy of diners and evening revelers. If you thought the cathedral was old, it has nothing on the city itself: Lisbon, Portugal, is the oldest in Western Europe, eclipsing Rome by nearly five centuries, and the other great capitals by at least a millennium. This is how you spend 48 hours here. Some geographic orientation is necessary. Lisbon is situated on the eastern side of a somewhat peninsular piece of land that looks on the map a bit like San Francisco turned upside down, but is in reality about three times the California city's east to west width. The Rio Tejo (Tagus River, the same that flows through Toledo, Spain) opens very wide here as it meets the Atlantic Ocean. The old city is built up around a steep hill on which the Cathedral sits, roughly in the south / south-eastern quarter, with some of the more modern urban development a bit northwest of there along the metro's blue line. If you find you've forgotten something in your suitcase, hit up El Corté Ingles department store in this area, near the São Sebastião station where the red and blue lines meet. Lisbon Portela Airport and the Oriente train station connect the city to to the world. Both are on the Metro's Linha Vermelha (red line), so transportation from any part of the city reached by subway service to either the airport or train station is easy. We arrived by train from Porto and rode the metro into the old city; we then called an Uber to the airport several days later when we departed. All combinations thereof are easy. The metro feels clean, safe, and efficient as long as you're going where it goes. We can quibble on usefulness in that there are no lines or stations in the western part of the city down near the southern waterfront. The route map was otherwise sufficient to get us where we needed to go, but doesn't feature the kind of mega stations where three or four lines come together for big passenger exchanges (it reminded us a bit of of the Boston T in that respect). We had to wait in line for a human to sell us a re-usable green Viva Viagem card at the busy Oriente train station, so checked around online to determine that these cards are usually available through automated machines (we assume some sort of malfunction the day we arrived, so won't hold this against anyone). These cards are both simple to refill at kiosks in the metro stations, and nearly universal for public transit around the city. This is great news, because trams (street cars) reign supreme here, filling in for some of metro's obvious coverage gaps along the city's east-west waterfront axis (make sure you fill your card with enough money for the tram, as you can't refill aboard or at the stops on the street). Swipe your card on entering and departing the metro, but only on boarding the tram. Lisbon's municipal government has apparently been very supportive of Airbnb expansion in the city. 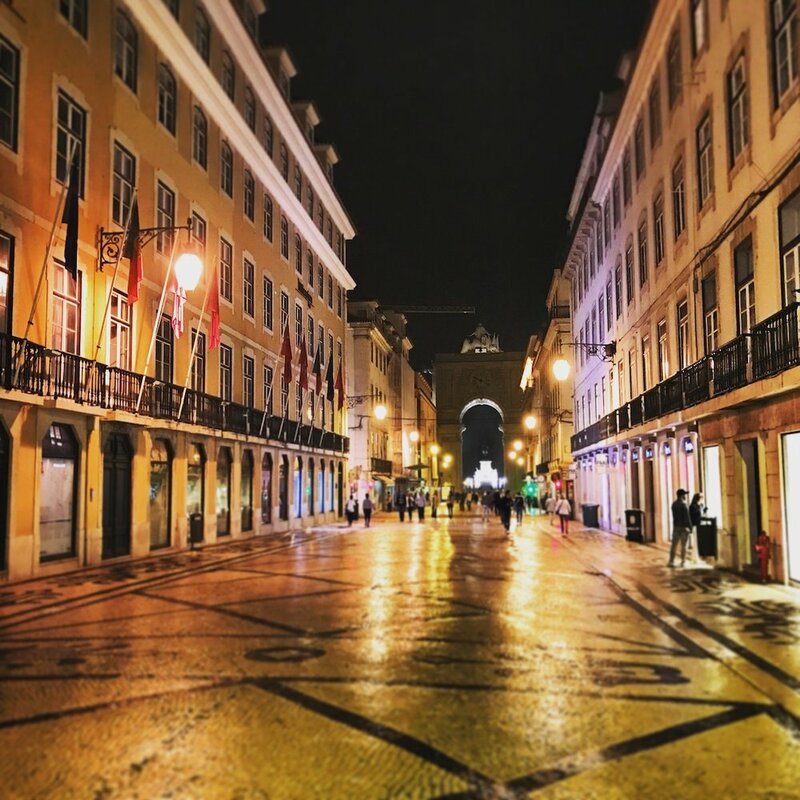 We absolutely loved the flat we rented on the tiny Canastras street just north of Praça do Comércio and the blue line's Terreiro do Paço station, and a block and a half immediately down the hill from the cathedral. This is a great area of town for its old city character, abundance of things to see and places to eat, and transportation centrality heading north and west. Direct your Airbnb search here, and you should find great options. Background Reading: I've never used Airbnb. Should I? How does it work? How do I find one that's best for me? All of that said, local encouragement of Airbnb has led to a booming business, which has in turn alienated a number of the residents whose neighborhoods have been invaded by tourists. We were concerned by some nearby signs that demanded Airbnb go away. Our advice, as always, is to be infinitely respectful of the people and neighborhoods that you're lucky enough to be living amongst while in town. Walk from Praça do Comércio (the central waterfront plaza) up Rua Augusta to Praça de D. Pedro IV (known as Rossio Square). Do this during the day. Do this at night. Eat and drink on your way, pass the time, enjoy yourself. If you're staying in the area we recommend, you're already very close. Then explore the little neighborhoods nearby with an eye for a quiet place to have dinner. Visit the cathedral, Sé de Lisboa, which dates from the twelfth century but has evolved splendidly having been rebuilt and modified over centuries of frequent earthquakes. Simple, understated, it conveys a feeling of holiness rather than grandeur, and stands in start contrast to much of what you'll find elsewhere in Europe and particularly in neighboring Spain. Keep walking up the steep hill from the cathedral until you get to Portas do Sol. Have a drink there on the terrace while you look out over the Tagus River at one of its widest points. Then explore the neighborhoods and little shops further up the hill en route to the fortress called Castelo de São Jorge. We suspect that folks had trouble finding their way out of this part of town before the advent of GPS. It's quite nice. Back down at the waterfront, catch the tram from the north side of the Praça (near the arch) west to the Mosteiro dos Jerónimos monastery. Completed around 1600 and later the site where the European Union's Lisbon Treaty would be signed in 2007, it would be hard to overstate what a beautiful piece of architecture and history this place is. Don't miss it. Walk westward from the monastery to Torre de Belém (Belém Tower), perhaps Lisbon's most famous site. Originally built as a component of the city's coastal defense, the ornate and absolutely unique structure now feels straight out of Game of Thrones (were it not for all the people visiting with you). It's particularly striking late in day as the sun is beginning to set over the water to the west. I recommend lunch at the waterfront when over here. We were sad to not have time or the inclination to trudge through the rain to the Navy Museum while we were in the Belém area. We can't recommend it from personal experience either way, though it is on our list for a return visit. Lisbon is a wonderful city, and it deserves more than the 48 hours we've prescribed for you here. That said, it competes with much else to immerse oneself in on the Iberian Peninsula. Though it is Portugal's largest city, its half-million residents make it small by the standards of other European capitals, lending it an aura of charming intimacy that can be hard to find elsewhere. We think this really shines through when sitting down for a meal headlined by fresh fish in a small restaurant. As always, don't miss the chance to drink the country's phenomenal wine.